Every time I catch Jay Baer’s out of office messages, I am immediately filled with envy. From funny and unexpected references to wanderlust-worthy destinations, Jay’s out of office messages were hard to match—until now. Enter the Westin OOO Generator. Inspired by the belief that a “better vacation deserves a better out of office message,” Westin Hotels & Resorts tapped humorists to help travelers step up their boring out of office replies. Hosted on a dedicated microsite, creating a clever out of office is five easy steps away. Simply fill in a few basic questions, including your name, the type of trip you’re taking, who you are traveling with (family, couple, friends), the dates you’re away, and who at work will be covering for you. Upon completion, your snazzy new out of office is generated. Users can copy the text to drop into their out of office, or share a custom video on Facebook or Twitter. Was my OOO any match for Jay’s? I’ll let you—and Jay—be the judge. Beyond the clever campaign, what makes this interesting from a marketing perspective? In the era of customer experience, understanding and catering campaigns to the end user is critical. Westin Hotels & Resorts was smart to tap into something we all do when heading out on vacation: create an OOO. While many of us need to write up an out of office message before a vacation, how many enjoy or think much about the process? By creating a simple and easy to use OOO generator, Westin is inspiring its core audience of travelers to have a little fun with those often mundane messages. Although not all professions could get away with this type of OOO, the spirit of the campaign speaks to travelers and is designed to amp up their excitement leading into a trip. Not every company is going to have a comedy writer on staff. 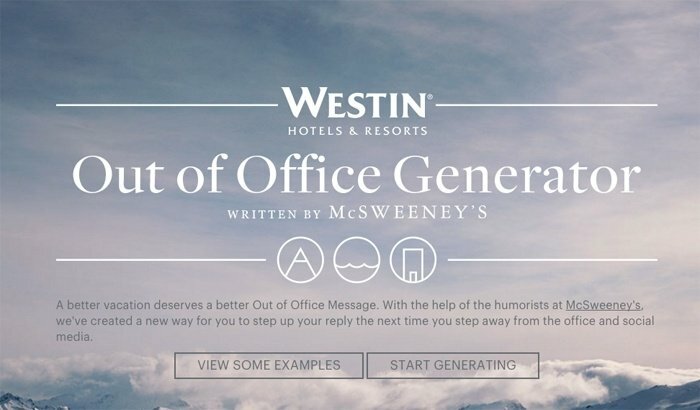 In order to add humor to its OOO generator, Westin partnered with McSweeney’s, a publishing company that operates a daily humor website, to take the OOO content to the next level. Strategic partnerships like this are great—whether it’s tapping into a specialized content creator or an influencer with a targeted reach. These relationships lend credibility and can take content to the next level. Part of the appeal of this campaign is that Westin can measure and track audience participation from its microsite. Travelers have to enter fairly specific details about their upcoming trips, including the dates and who is covering for them. Clearly, some may simply want to test the tool and make up some of those details, but there’s an opportunity here for Westin to extend the life of the campaign with future offers, targeted promotions, or additional content wishing people a great trip or thanking their co-workers for covering for them. When designing campaigns around the end user, go beyond the present. Plan for how you can maximize and continue that relationship to create stronger bonds with your customers and convert them into long-term brand advocates. Oh, and Jay… next time I’m on vacation (or holiday, as we say here in the UK), I’ll be ready for you. Prepare to be dazzled!